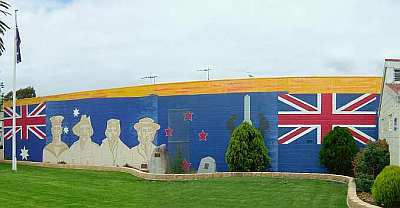 We depart Launceston at 8am and our winding road passes though bushland to stop at the Sidling Lookout to view the entire valley from the hills to the sea. We marvel at Legerwood’s WWI memorial tree carvings, (my montage is made in commemoration of this amazing memorial.) We drive through the Myrtle rainforest at Weldborough Pass and reach St. Helens at lunch time. 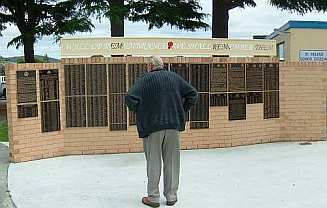 This small town's Soldiers Memorial records the area's huge supreme sacrifice to war. We pause at a popular holiday spot, Coles Bay near the entrance to Freycinet National Park. The Freycinet Peninsula extends out into the sea and consists of knuckles of granite mountains surrounded by bays and white sand beaches. As we entered the park ahead the peaks of the Hazards. 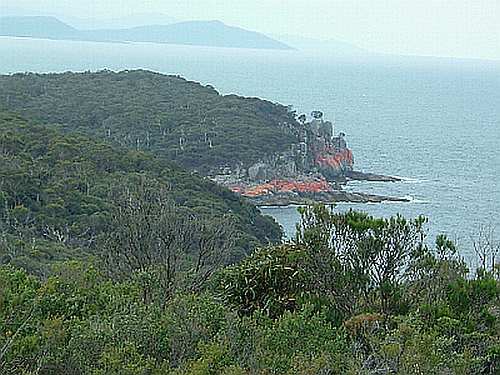 Freycinet is effectively two eroded blocks of granite - the Hazards and the Mt Graham/Mt Freycinet sections of the peninsula - joined by a sand isthmus and the peninsula wasas formed over 400 million years. The low lying isthmus joining these areas was built from gravel that eroded from the mountains and washed into place by higher sea levels. When the sea receded the isthmus was exposed. 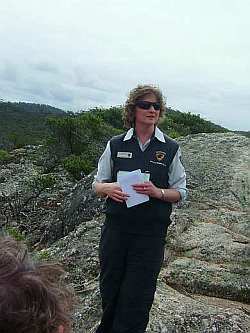 Weathering and erosion of the granite mountain areas still continues today. 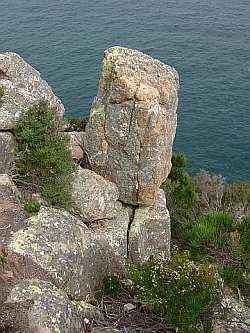 Rock surfaces discolour with a deposit of iron oxide and other minerals in the water emerges from joints on large granite rock surfaces(see photo above.) 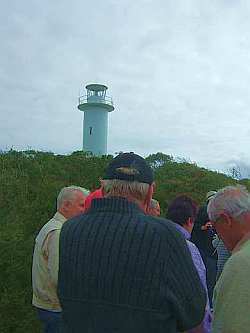 Our Park guide explained the flora and fauna and wild life in sea, land and air. Our overnight stay is at the Bicheno "Beachfront" hotel overlooking Waubs Beach. This seaside resort area is known for fishing, snorkelling, safe surf beaches and interesting coastal walks.